It never fails at a conference or a webinar or on twitter or a blog post someone always says – but I don’t have time for that, IT will never let us do that, administration will never let us do that. Never mind what “that” is. There is always a reason. An excuse. Yes an excuse. I don’t understand these people. I’m not sure what they are looking for, magic beans? 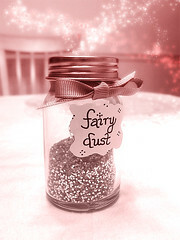 fairy dust? There isn’t any. I read this post Yeah You’ve Got Problems. So Solve Them by Will Richardson during the mad rush between a workshop and ALA in July. It really stuck with me. I think I’m going to borrow his approach. That is a problem. What are you going to do about that? I hear ya’. How you gonna fix that? I love talking with other librarians and library staff. But there is always a least one person who wants the presenter to take them by the hand, follow them back to work and wave my magic wand over their problem. Guess what? No one else can solve your problem. It’s your problem. At your job. No one knows that situation better than you. People can give you tips and suggestions and motivations and links, but no one can fix your problem. That’s your job. Maybe this post is harsh, but I think a call for a little responsibility is in order. Sometimes that means doing research on your own time, in the evening (gasp! ), fighting for what you believe in, what you need, what your patrons need, even if the person you are fighting is a coworker. Many of the people who say they don’t have time just don’t have the ability to prioritise. I work part-time and have a job description which is physically impossible to complete within the hours alloted. Like everyone else, I have commitments outside of work. At the start of every shift I have to decide what take precedence. When an issue comes up, I have to decide if I can deal with it within my work hours and, if not, if it warrants me using personal time to deal with it. We all have to learn that taking the time to think something out is not a waste of time. The name for this affliction is called laziness. People who claim not to have the “time” aren’t interested in solving the issue in the first place. So they spend more time and energy complaining before some Samaritan gets tired of hearing them whine and presents a solution. Sounds like the old adage, you can’t help those that aren’t willing to help themselves. It does get frustrating. The other challenge I come across is a misunderstanding about the difference between an educational session and consulting. I target my content when teaching/speaking as best as I can to my audience, but I could never speak in one session to every single unique participant’s situation. For me instruction is what you need to know in general and consulting is what you specifically need to know. That’s a bit of a generalization, but it helps me focus my thinking about my work. I love to help find solutions for my staff when they run into problems they perceive to be insurmountable. Whenever we start a new project, I brainstorm every possible negative angle someone can throw at the project to prepare for it. I try to eliminate/address/remove the obstacles. Or if they bring the obstacle to my attention, then I try to help them remove it. I’m often taken aback by their ingenuity to avoid something new. Our library tech guys recently told me that one of my requests was too much of a hassle. I told them to tell me the idea is lame, but don’t tell me it’s a hassle. Figure out a way to automate it! Two days, 3 call conference calls, and several email exchanges later, I got what I wanted. There’s a surprising lack of motivation in our profession…and of course this doesn’t apply to all librarians. One of my mantras through grad school was “a constraint, not an excuse”. There are things that make it genuinely harder, maybe much harder, to accomplish other things. Constraints. But none of them give you permission to give up and do nothing. It was frustrating to me that childcare constraints meant that I wasn’t able to get involved in student organizations the way I wanted to in grad school, but I knew I would hardly be able to go to prospective employers and say “well, all I got done was the MLS, but hire me anyway because there were good reasons I couldn’t do more”. Ha! I just had to find things I could do. I might believe people when they say “I can’t do X”. Maybe X is just not possible in their organizational context, or the resources you would have to burn to accomplish X would be better spent in some other way. Where I stop believing is when they say “I can’t do X, so I can’t do anything”. Hm. No. @librarianbyday good post, also like the Eternal September. This post really resonated with me. At my workplace,we are undergoing a review process, and have identified issues to work upon resolving. I have found some people to pour cold water on any suggestions that involve positive action, and who seem to want to endlessly discuss, but not to actively move, for change. Yes it is frustrating – people seem not really motivated to make that last step to change, although they say they want change. I am still working out what is the best way to approach this without getting demoralised myself. One suggestion I make when committees or discussion seem to be slowing down progress or even bringing it to a stop is that you set a timeline. AT the beginning state By X date we will move forward even if we don’t have a perfect plan at that point we will proceed with what we have. I know that sometimes fighting for what I think my patrons need is often a hassle–lots of forms, lots of delays, lots of folks saying, “I don’t know” or “We need to wait on this”, but, in the end, I never stop trying. That is a mantra we all need…never stop trying. Kristine – libraries need more people like you! While in general I think that this is an excellent post, there really are some jobs where administration won’t let employees do things that would be of great benefit. I’ve run into this situation at my work and it truly is insurmountable in this case, even after much effort and work. The “fix-it” then is to move on to somewhere where innovation and creativity are possible. Not harsh at all and you echo sentiments that are near/dear to me. What I tell people is – it’s all a matter of choice. We all get the same 24 hrs in a day. How you choose to spend those hours are up to you. Okay, you want to do this next cool ____ – you don’t get anymore hours so what has to go? You say nothing but I would beg to differ. We could all stand to stop, take a look at the time wasters in our lives. You might be surprised what can go and what can stay. A fellow librarian here says he hates it when people tell him they don’t have time to read ___. Again, it’s a matter of choice. Try not watching TV for 1 hr and read instead – TV or book….it’s your choice. Neither is right or wrong just don’t use the excuse is all I ask.